Arc mobile is still new to us, but in due time we will know how they play in smartphone industry. As we previously shared the Arc Mobile Nitro 450QD for having great specs with affordability, now lets take some insights about Arc Mobile Nitro 500D. 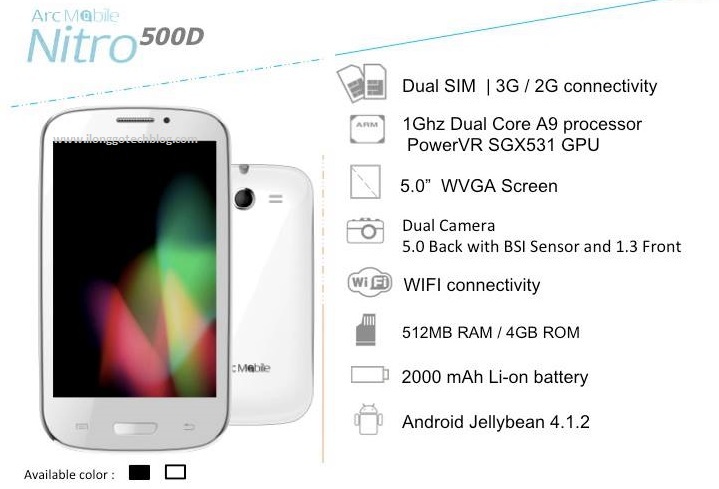 As you can see in the picture it is Dual Core which literally comes from 500D, and 500 means 5inch, as you know a smartphone with 5inch display is already called a phablet or phone-tablet. To summaries the story about Arc Mobile Nitro 500D, its a all new gadget with specs of the latest Dual Core smartphones you can have today. Arc Mobile Nitro 500D is priced at Php4,795 SRP | Available now in the Philippines nationwide. What's in the box of Arc Mobile Nitro 500D? Share your experience with Arc Mobile Nitro 500D! hi i'm looking for the battery of arc mobile nitro 500d battery ..do you have one? @ Anonymous: I am also looking for a battery for the same model. I've been to to malls selling the phone itself but to no avail. i was told last week that the accessories will be available by December 2014.